Your privacy is important to Bank One. This Privacy Notice explains how we collect, share, use,and protect your information. It also explains your rights in relation to the collection of personal information and how you can exercise those rights. It covers Bank One’s many online services, including Bank One websites, mobile applications,and branded social media sites or pages, as well as any interactions you may have with us while viewing content provided through one of Bank One’s digital advertising campaigns. It also covers information we collect for any personal products or services you have with us, including savings, loans, credit cards, investments and insurance, and when you call us, visit one of our branches, or ask about any of our products and services. The Bank One Privacy Notice continues to apply even if your agreement for banking, insurance or other products and services with us ends. It should also be read alongside your banking or insurance terms and conditions, as these include sections relating to the use and disclosure of information. Wherever we have said ‘you’ or ‘your’, this means you, any authorised person on your account,anyone who does your banking or deals with us for you (e.g. trustees or executors, attorneys under a Power of Attorney) and other related people (including authorised signatories, partners, members and trustees). If you’re an insurance customer it also means you, named insured parties or beneficiaries under your policy, dependants, claimants and other third parties involved in an insurance policy or claim (such as witnesses). When we say ‘we’, we mean Bank One Limited which acts as a data controller with respect to your personal data. Unless otherwise stated below, the data controller for the purposes of this notice is Bank One Limited. 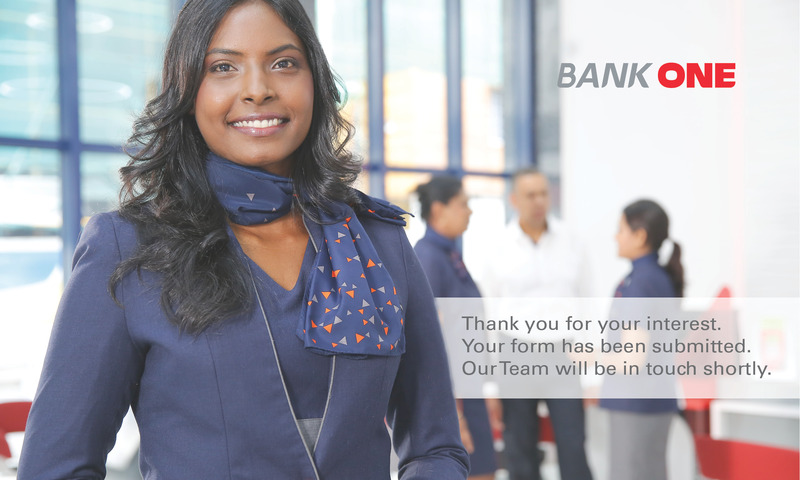 The address for Bank One Limited set out in this notice is 16, Sir William Newton Street Port Louis, Mauritius. If you’d like to get in touch with us, you can also find our contact details below. We will only collect your information in line with relevant regulations and law. We may collect it from a range of sources and it may relate to any of our products or services you apply for, currently hold or have held in the past. We may also collect information about you when you interact with us, e.g. visit our online services, call us or visit one of our branches, or ask about any of our products and services. Some of it will come directly from you, e.g. when you provide your ID to open an account. It can also come from your financial advisor, broker or intermediary, the insurance company which provides the insurance policies we offer, or any other sources from which you have asked us to obtain information. We might also collect some information from publicly available sources. The type of information we collect will differ depending on whether you are a banking, wealth or insurance customer. any other information which is relevant to a claim that you make. information that we need in order to meet regulatory obligations, e.g. information about transaction details, detection of any suspicious and unusual activity and information about parties connected to you or these activities. -information from publicly available sources. To help keep you and your money safe, we may record details of your interactions with us. We may record and keep track of conversations you have with us including phone calls, face-to-face meetings, letters, emails, live chats, video chats and any other kinds of communication. We may use these recordings to verify your instructions to us, assess, analyse and improve our services,train our people, manage risk or prevent and detect fraud and other crimes. We may also capture additional information about these interactions, e.g. telephone numbers from which you call us and information about the devices or software that you use. We use closed circuit television (CCTV) in and around our premises and these may collect photos or videos of you, or record your voice. We will use your information to meet our compliance obligations, to comply with other laws and regulations and to share with regulators and other supervision authorities that Bank One may be subject to. This may include using such information to detect or prevent crime (including terrorism financing, money laundering and other financial crimes). We will only do this on the basis that it is needed to comply with a legal obligation, when it is in our legitimate interests and that of others, or to prevent or detect unlawful acts. We may use your information to provide you with details about our products and services, and also those of our partners and other relevant third parties. We may send you marketing messages by post, email, telephone, text or secure messaging. You can change your mind on how you receive marketing messages or choose to stop receiving them at any time. To make that change, please contact us in the usual way. If you ask us not to send you marketing messages, it may take us a short period of time to update our systems and records to reflect your request, during which time you may continue to receive such messages. Even if you tell us not to send you marketing messages, we will continue to use your contact details to provide you with important information, such as changes to your terms and conditions or if we need to provide you with specific information in order to comply with our regulatory obligations. We may use your information for market research and to identify trends. Market research agencies acting on our behalf may get in touch with you by post, telephone, email or other methods of communication to invite you to take part in research. We will not invite you to take part in research using a particular communication method if you have expressly asked us not to get in touch that way. Any responses that you provide whilst participating in market research will be reported back to us anonymously unless you give us permission for your details to be shared. We keep your information in line with our data retention policy. For example, we will normally keep your core banking data for a period of seven years from the end of our relationship with you. This enables us to comply with legal and regulatory requirements or use it for our legitimate purposes such as managing your account and dealing with any disputes or concerns that may arise. We may need to retain your information for a longer period where it is required in order to comply with regulatory or legal requirements or where we may need it for other legitimate purposes, e.g. to help us respond to queries or complaints, fighting fraud and financial crime,responding to requests from regulators, etc. If we do not need to retain information for this period of time, we may destroy, delete or anonymise it sooner. Your information may be transferred to and stored in locations outside of Mauritius and the European Economic Area (EEA), including countries that may not have the same level of protection for personal information. When we do this, we will ensure that it has an appropriate level of protection and that the transfer is lawful. We may need to transfer your information in this way to carry out our contract with you, to fulfill a legal obligation, to protect the public interest and/or for our legitimate interests. In some countries, the law might compel us to share certain information, e.g. with tax authorities. Even in these cases, we will only share your information with people who have the right to access it. You can obtain more details of the protection given to your information when it is transferred outside of Mauritius and the EEA by contacting us using the details in the ‘More details about your information’ section below. the right to object to, and to request that we restrict our processing of your information in some circumstances. Again, there may be situations where we are authorised to continue processing your information and/or to refuse such request. You can exercise your rights by contacting us using the details set out in the ‘More details about your information’ section below. You also have a right to lodge a complaint to the Mauritius Data Protection Office by visiting http://dataprotection.govmu.org, or to the data protection regulator in the country where you live or work. If you apply for new products or services (including credit such as a housing loan, lease facility, personal loan or credit card), we may perform credit and identity checks with the Mauritius Credit Information Bureau (MCIB). When you use our banking services, we may also make periodic searches at MCIB to manage your account with us. To do this, we will share your personal details to the MCIB and they will provide us with information about you. This will include information from your credit application and about your financial situation and financial history. The MCIB will supply us with both public and shared credit information, financial situation, history and fraud prevention information. We will continue to exchange information about you with the MCIB as long as you have a relationship with us. We will also inform the MCIB about your repayment history. If you borrow and do not repay in full and on time, the MCIB will record the outstanding debt. This information may be supplied to other organisations by the MCIB. When the MCIB receives a search request from us, they will place a search footprint on your credit file that will be seen by the Bank of Mauritius. If you apply for a bank account or credit (e.g.when you apply for a housing loan, consumer loan, lease facility or credit card), we will obtain details of your credit history (and share information about you with the Credit Bureau) and use this information to work out how much you can afford to borrow or pay back. We may also carryout further credit checks on you while you are a customer in order to maintain an accurate and up-to-date record of your credit history. We may use your personal details to verify the accuracy of information that you have provided to us to prevent criminal activity, fraud and money laundering, manage your account(s), trace and recover debts and ensure any offers provided to you are appropriate to your circumstances. If you are making a joint application, or inform us that you have a spouse or financial associate,we will link your records together. You should discuss this with them, and share this information with them before submitting the application. The MCIB will also link your records together and these links will remain on both your individual files until you or your partner successfully files fora disassociation with the MCIB to break that link. details of guarantors to the loan, education and qualification history, assets owned, client’s net worth, employment details. The scoring system will mostly use similar data as available on core systems for existing clients. The remaining data needed is exactly the same information that is presently collected through physical files and saved on the bank’s archive system. Some scoring tools share data to third parties who use it in their worldwide database, such as Moody’s, in order to give a score or for calibration purposes. The personal information you provide or which we have collected from you, or received from third parties, will be used to carry out these checks in order to prevent fraud and money laundering, and to verify your identity. We will process personal information such as your name, address, date of birth, contact details, financial information, employment details, and device identifiers, e.g. IP address. Together with the fraud prevention agencies, we may also allow law enforcement agencies to access and use your personal data in order to detect, investigate and prevent crime. If we, or a fraud prevention agency, have reason to believe there is a fraud or money laundering risk, we may refuse to provide the services and credit you have requested. We may also stop providing existing products and services to you. A record of any fraud or money laundering risk will be retained by the fraud prevention agencies and may result in other organisations refusing to provide services to you. The information we hold about you could make it easier or harder for you to get credit in the future. You are responsible for making sure the information you provide to us is accurate and up-to-date, and you must inform us if anything changes as soon as possible. If you provide information for another person (e.g. a joint account holder, a beneficiary under an insurance policy or a dependant), you will need to direct them to this notice. We use a range of measures to keep your information safe and secure including encryption and other forms of security. We require our staff and any third party who carry out any work on our behalf to comply with appropriate compliance standards including obligations to protect any information and applying appropriate security measures for the use and transfer of information. if you would like further information on anything we have said in this Privacy Notice, or to contact our Data Protection Officer, write a letter addressed to The DPO, 16, Sir William Newton Street, Port-Louis, Mauritius or send an email to [email protected]. This Privacy Notice may be updated from time to time and the most recent version can be found at bankone.mu/en/privacy-notice.